The Bismarckian precept that two-front wars are disastrous shaped his foreign policy. He created a gigantic balance-of-power, which kept European peace from the formation of Germany in 1871 until 1914. Needless to relate 43 years of peace wasn’t a blessing for career soldiers. Those 43 years of peace meant the German general staff had no practical experience of warfare. Their experience was war games. The Schlieffen Plan, 1905, is an elegant war game masquerading as a viable battle plan. The outcome of this plan vindicated Bismarckian thinking. Novice generals, in this case Falkenhayn, obstinately resisted the actuality of real warfare. Verdun was a needless catastrophe. Erich von Falkenhayn had an insignificant role in the Chinese Boxer Rebellion learning no useful lessons for European warfare. Unfortunately for the 1914 German army he was their Commander-in-Chief. No German officer was better equipped than Falkenhayn for that role. They were all novices. War games were their forte and the outcome was that the German high command was intellectually crippled. They were dominated by group think and subservience to hierarchies. Falkenhayn orchestrated the modified 1914 Schlieffen Plan attack on France. 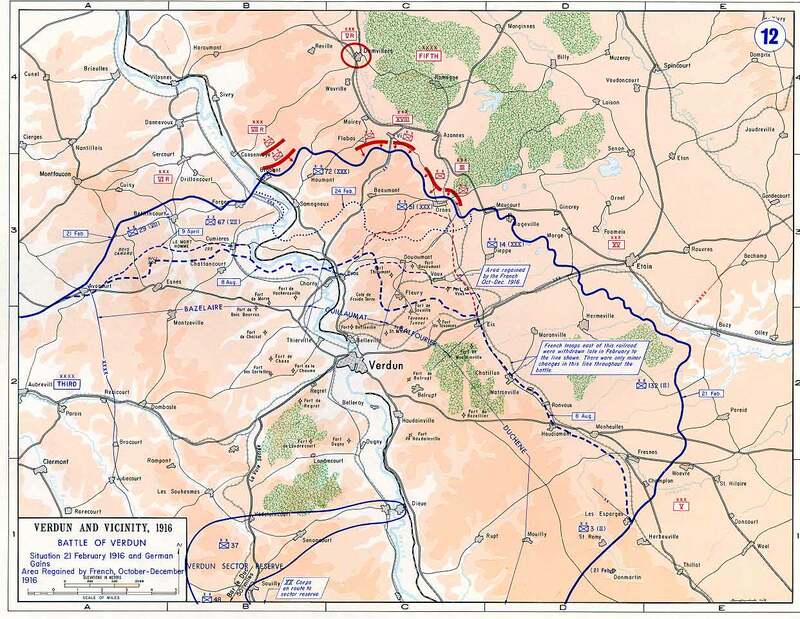 This attack relied on the Belgium army being unresisting, which they weren’t; and the Russians taking two months or so mobilising, which they didn’t. He was also a victim of competing influences from Hindenburg who siphoned troops to strengthen the eastern front. Falkenhayn believed that war could be time-tabled. The Schlieffen Plan had to be modified to take account of an active eastern front: modified for the worst. By October 1914 the die was cast for the next four years. Meanwhile very experienced French generals remained focused on the cavalry, which they imagined would sweep through gaps created by the infantry: they were culpably delusional. All the generals had had opportunities to learn about real warfare by 1916: none of them took it. Falkenhayn believed he’d found the Achilles heel of the French at Verdun. Verdun had psychological significance for the French and, he reasoned, they wouldn’t make a tactical withdrawal whatever the circumstances. Verdun was designed as a battle of attrition. Falkenhayn intended to ‘bleed France white’ by sucking in all their reserves to the point that they would have to call for peace. He didn’t plan a ten month attritional battle. Instead he was ‘captured’ by the logic of the situation. Verdun was a chaotic desperate nihilistic battle driven by its own momentum, an out of control juggernaut, as it were. Bismarckian strategic thinking factored in ‘known unknowns’. Falkenhayn’s naivety was untouched by two years of catastrophic warfare. He correctly identified Verdun’s iconic status but didn’t appreciate the depth of French patriotism. Worse: Falkenhayn ignored the Russians. The Brusilov Offensive was surprisingly successful reducing transfers of troops from east to west. Falkenhayn’s dream ended when Haig initiated the battle on the Somme opening a significant ‘second’ front. The battle of the Somme lasted four and a half months and obliterated the possibility of a successful outcome at Verdun*. Falkenhayn was intellectually paralysed and Verdun continued until the 18th December 1916 five and half months after the Somme attacks began. The German high command relied on brute force at key moments in the war. They didn’t have the intellectual flexibility to recalibrate once things didn’t go to plan. If artillery bombardment, poison gas and mass attacks failed- and they all did- their decision was to repeat. The classic failure was the battle of Verdun. None of the surprises that hit Falkenhayn were actually very surprising. During the ten months of Verdun the German generals wanted to do something- anything. The tragic carnage that ensued was the price of naivety. *German casualties at Verdun totalled c. 500,000: French casualties c. 400,000. In other words the exact opposite of Falkenhayn’s intention, namely to bleed France white. Verdun’s grim statistics were more-or-less matched, in half the time, at the Somme. UK/ French casualties c.434,000 and the Germans c.500,000. The Somme wasn’t a side-show meant to divert German forces it was a very significant battle in its own right. Falkenhayn’s war of attrition ground down his army. Tangentially it also was part of the provocation of the French mutinies in 1917. This entry was posted in History, War and tagged battle of the Somme, battle of Verdun, Douglas Haig, First World War, the long peace 1872-1914, von Falkenhayn. Bookmark the permalink.